We are proud to sponsor the Great Mountain Ginseng Day Tour in June 11 and June 12, 2011. 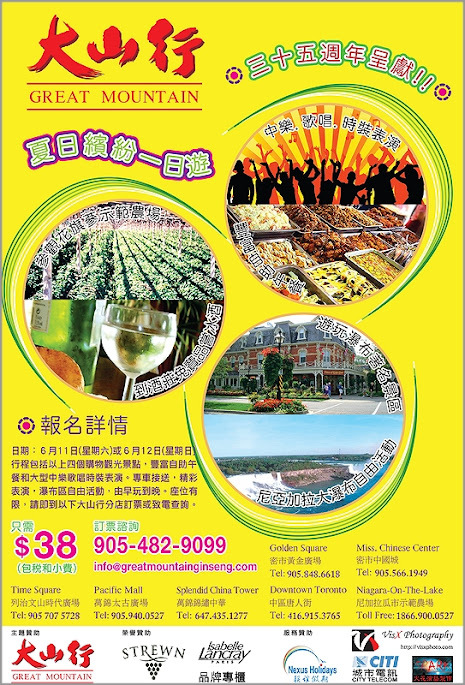 The tour includes visit to the Great Mountian Ginseng Farm in Niagara-on-the-Lake, transportation, lunch buffet, and much more. It costs only $38 per person. For detail and ticket, call 905-482-9099 or visit any of the six Great Mountain Ginseng retail stores in the GTA. Great Mountain Ginseng is the first Chinese owned and operated corporation to establish a major commercial ginseng Agri-business in Ontario, Canada. Due to the particular soil and weather, Ontario produces the highest quality ginseng in the world. Great Mountain Ginseng has accumulated over 30 years of experience and knowledge of Ginseng. Not only are they well respected in North America, but also recognized worldwide as the leader in providing consumers with the highest quality ginseng and ginseng related products worldwide. 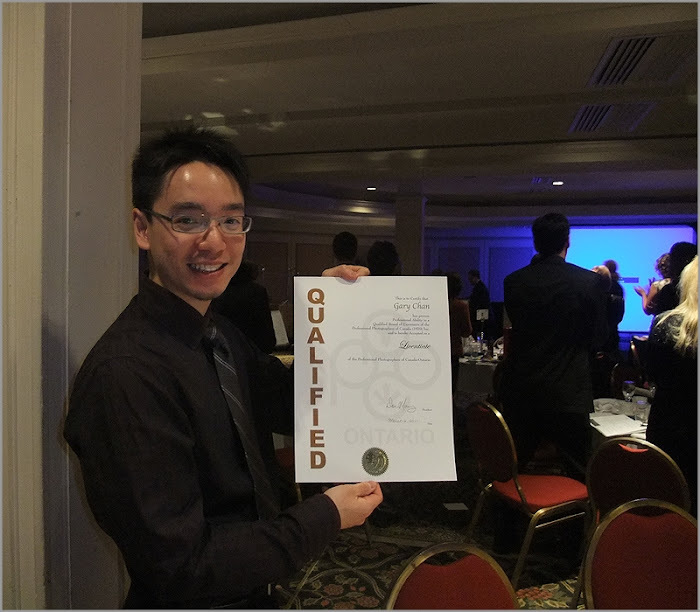 Gary received the Licenciate Professional Photographer of Ontario (LPPO) designation on March 6, 2011. Gary has proven his Professional Ability to a Qualified Board of Examiners of the Professional Photographers of Canada (1970) Inc. and is accepted as a Licentiate of the Professional Photographers of Canada-Ontario. Congratulations!!! Finally, the set of look of Anjali in traditional Indian costume. It is a great experience shooting outdoor during snowy winter time. Other than frozen fingers and toes, some other unexpected things have happened to us. From the 3 recent outings, 2 of them we ended up bringing broken/damaged equipments back. - I dropped my camera to the concrete floor (ouch!) and (fortunately only) broke the lens hood. Well, the tripod is pretty old. Other than the tubes, it is mostly made of plastic. I guess it is not made for winter weather. For the flash, I do not believe it could be that fragile. I mean, it is an equipment designed to withstand most weather conditions. And it was not too cold that day (around -5 C). I brought it to Nikon's repair center today. And the technician said faulty flashes are not uncommon. When I need to purchase a flash in the future, I know what to do when the salesman suggests me to buy extended warranty. About the broken hood, it was just plain stupid of me to detach the camera from the camera stabilizer without holding onto the camera. I guess I have not had enough sleep for a while. 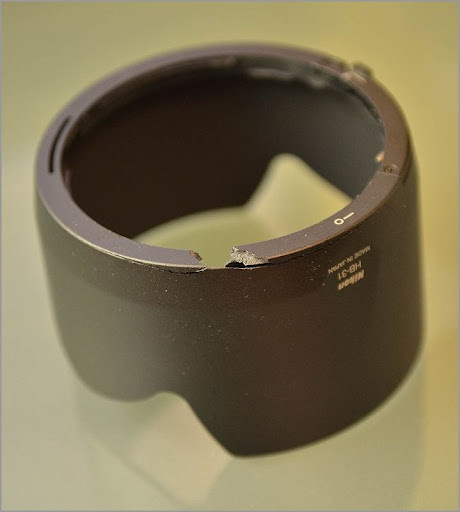 Good thing is that I only damaged the $30 lens hood instead of the $1400 lens or the $1200 camera. We now come up with an idea of how to prevent the same mistake from happening again - we will connect a "safety chain" between the stabilizer and the camera. So if we ever accidentally drop the camera again, the chain will most likely save it from hitting the ground. Only bring the most necessary equipments; always pay attention to what we are doing; buy externed warranty for flashes as they really can break. Plus, we need to consider adding winter photo shoot surcharge. I just picked up the repaired flash back from Nikon. It only took them a day to fix it - which is good. They fixed it by replacing the flash tube and updating the firmware. An interesting bit: before I left their repair center, I tried the repaired flash out. And I found that there is a white dot marked at the back side of the battery door. I asked the guy there about it. And he said that the dot is to indicate that they have done some modification to the flash. It will prevent the same problem from happening again. What I understand from our conversation is that, only certain older SB900 will require this modification. I guess this is a physical bug fix for the earlier batches.